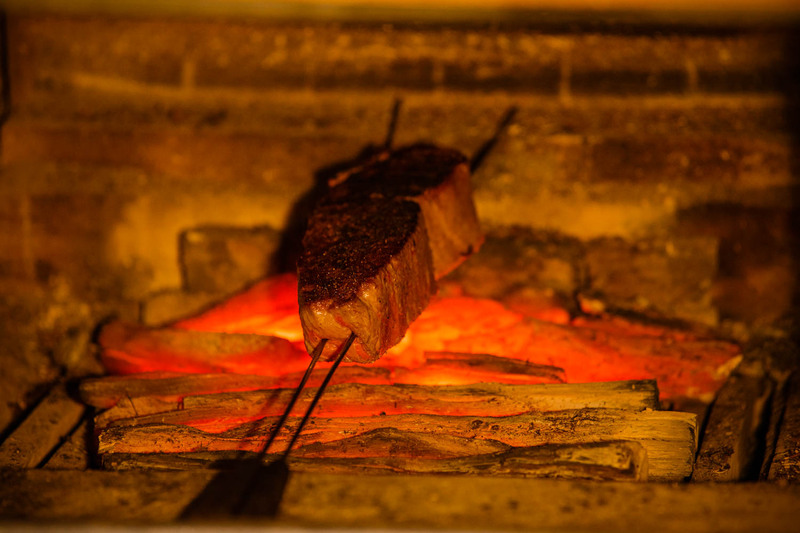 Sink your teeth into sumptuous Kobe-gyu steak, lovingly grilled in a charcoal-fired brick oven. The generous servings at IDEA GINZA are perfect when you really crave steak, and the experience does not end there. It includes a course of luxury seasonal ingredients, a cellar brimming with premium wines, and that feeling of excitement and expectation every time the door to the brick oven is opened. Filled with exclusive restaurants of all cuisines, this area really comes alive at night. 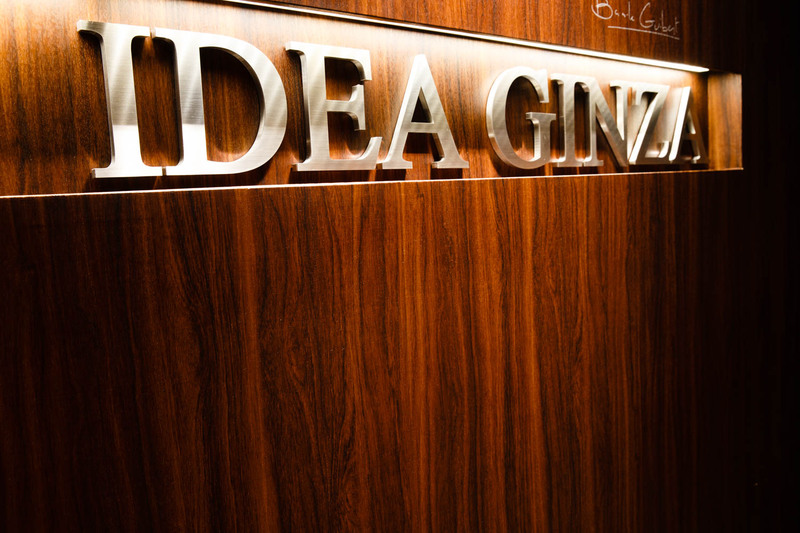 Rising to the seventh floor of a Ginza building, the shiny letters of IDEA GINZA greet you and you step into a space with a somewhat retro feel of a dark wooden interior, ruby red tablecloths and mustard leather chairs. Your eyes are immediately drawn to the slightly elevated open kitchen and the brick oven, or rogama in Japanese. Specially constructed when the restaurant opened in 2013, the oven door is opened by a pulley system revealing the red glow of the charcoals and the occasional jumping flame. 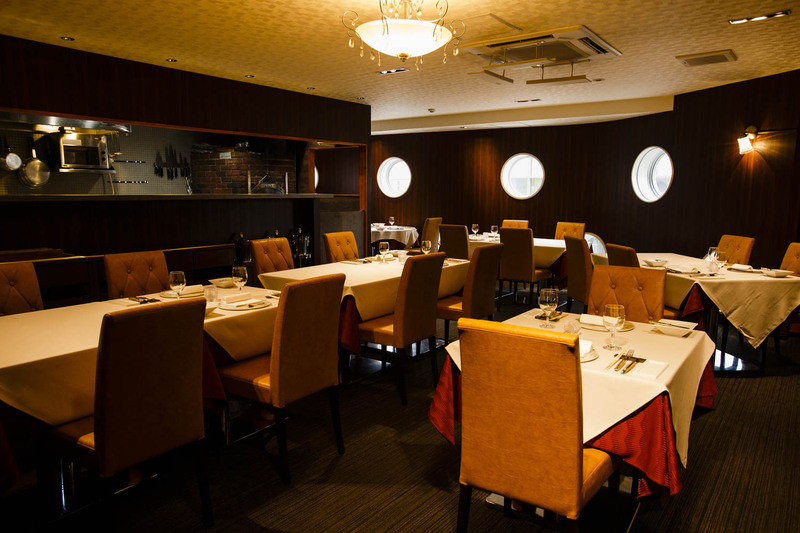 In the main dining room and two private rooms, tables are set with beautiful Arita-yaki platters from Kamachi Toho in black and white, as well as raised bread and butter stands. The flatware has the distinctive bee symbol of Laguiole, fittingly with handles made from cow bone, one of the first materials used by the knife-makers at the famous forge in Aubrac, France in the early 19th century. The chefs at IDEA GINZA skillfully prepare a full course of seasonal dishes, incorporating the strong sense of the season found in Japanese cuisine. 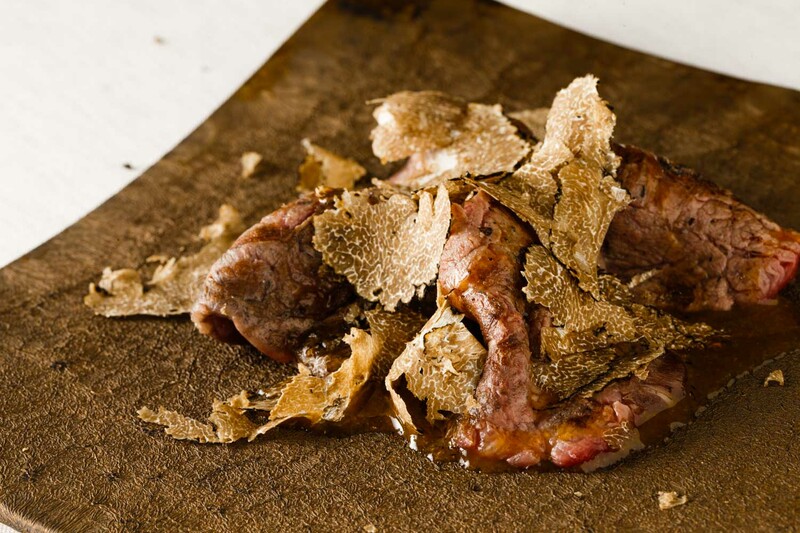 Following an amuse bouche, warm and cold appetizers may include a shrimp sashimi tart or seared beef carpaccio with an egg yolk truffle sauce and black truffle shavings. There is velvety ox tongue with incredibly mellow flavor and texture, and a dressed salad of seasonal leafy greens. There is no doubt, however, that the star at IDEA is the steak. Chef Sugai looks carefully at the white salt crystals as they fall onto the gleaming red fleshy surface. Cracked pepper is added and two skewers piercing the steak hold it as it is placed above the piping hot Kishu Binchotan charcoals. Considered by many as the world’s finest cooking charcoal, Kishu Binchotan is a type of white charcoal made by artisans in Wakayama Prefecture from the indigenous ubame oak. It burns at lower temperatures than other charcoal varieties and doesn’t release smoke into meat, locking in and not interfering with the natural flavor of the beef. Other methods of cooking steak require added fat, however the rogama method allows the beef to be cooked entirely in its own juices, which are released from the gentle marbling achieved by farmers who so lovingly raised the cattle. After just a few minutes held directly over the coals, the beef is then left to roast and rest in a cooler part of the oven before serving. Caramelized under the heat of the charcoals, the crispy finish of the salt and pepper crust on the outside is outstanding and highlights the succulent texture and beautiful red tones of the medium rare steak within. As you delve in, the beef bursts with delicious juices and you find the steak surprisingly light, despite its marbling and size. This contrast of textures can only be achieved with the rogama, and is the reason guests visit again and again. To complete the meal, you might enjoy a refreshing scoop of milk ice cream, with flavors mild enough not to erase the delicious aftertaste of the steak, and dark roast cold-brewed coffee. When selecting the course, guests are shown an array of premium beef cuts that have been secured through the beef auctions in Kobe and rested in-house until they reach the perfect condition. 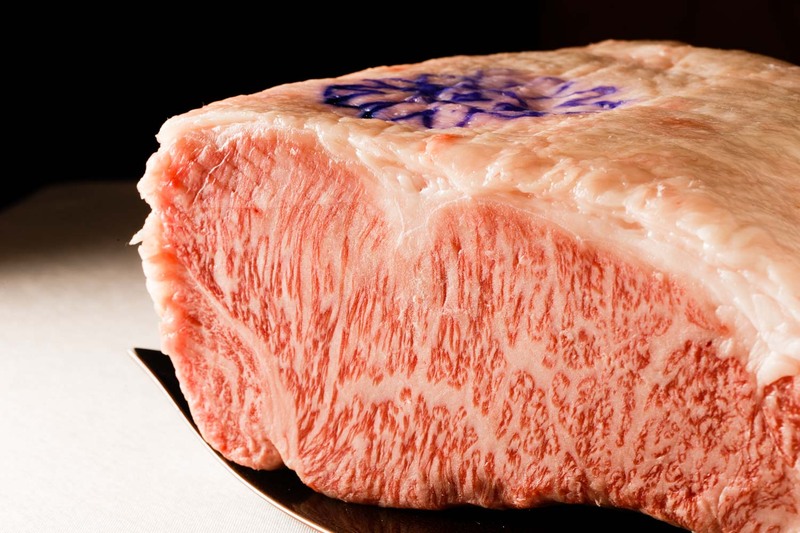 The brilliant purple chrysanthemum mark branded into the fat is proof that this is genuine Kobe-gyu, a variety of wagyu certified under the strictest of standards. 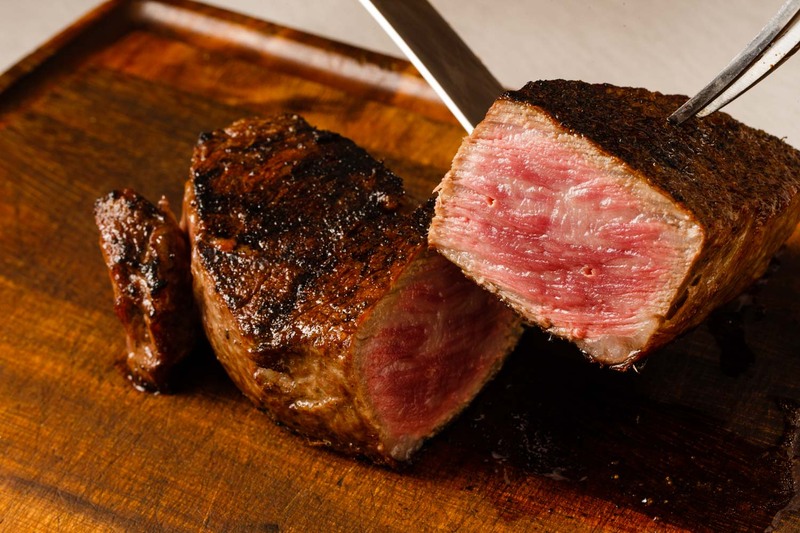 Rump, sirloin, fillet, chateaubriand, and an incredibly tender part from the upper thigh known as ichibo in Japanese – as your mouth waters trying to choose, you are relieved to hear that you can try more than one variety. 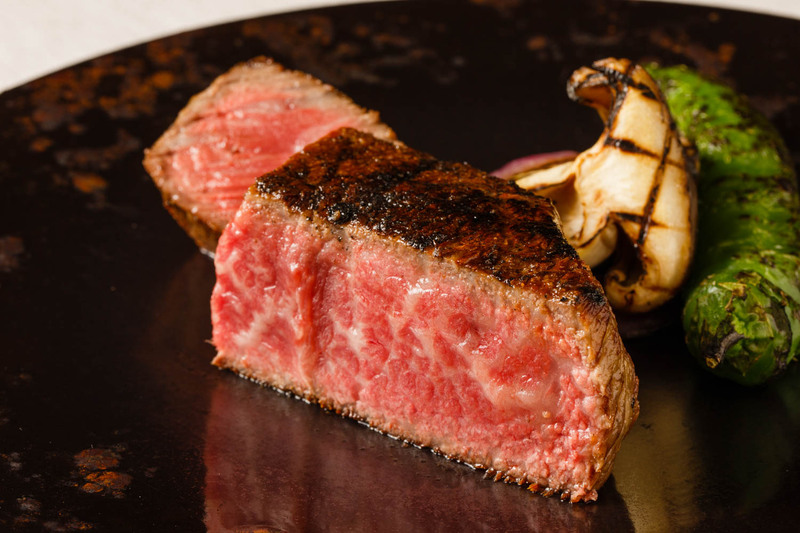 For guests who prefer leaner cuts of beef but don’t want to miss out on the umami that wagyu has to offer, the chef also prepares a selection of Tankaku Shorthorn wagyu from Iwate Prefecture. Seafood and other farm-fresh produce are delivered each day, sourced through selected providers at Tsukiji. The somewhat shy and unassuming man who masterfully prepares every steak at IDEA is originally from a small town in Niigata Prefecture. With no internet in his childhood, Masato Sugai’s main entertainment was television, and in particular, cooking shows. Having never experienced the flavors, Sugai was especially fascinated by French cuisine, and becoming a chef quickly became his dream. He experimented at home with western-style dishes like hamburg steaks, but it wasn’t until he left home for culinary school in Tokyo that Sugai got hands-on experience in specific techniques. At the age of 19 and with no prior experience, Sugai was hired by a steak specialist restaurant and put in charge of the rogama charcoal-fired brick oven. Intimidated at first, more than 30 years of experience have essentially made Sugai an unparalleled expert in the craft. Occasionally adjusting either the top or bottom draught to control the levels of oxygen in the brick oven, Sugai is methodical and focused as he gently turns the steak, checks the surface, and then moves it to rest in a cooler part of the oven until the center reaches that perfect place – medium rare. A sparkle appears in his eye as he describes the aroma of the crusty surface, the umami released in every bite, and the incredible contrast of the outside with the juicy, condensed flavor within. 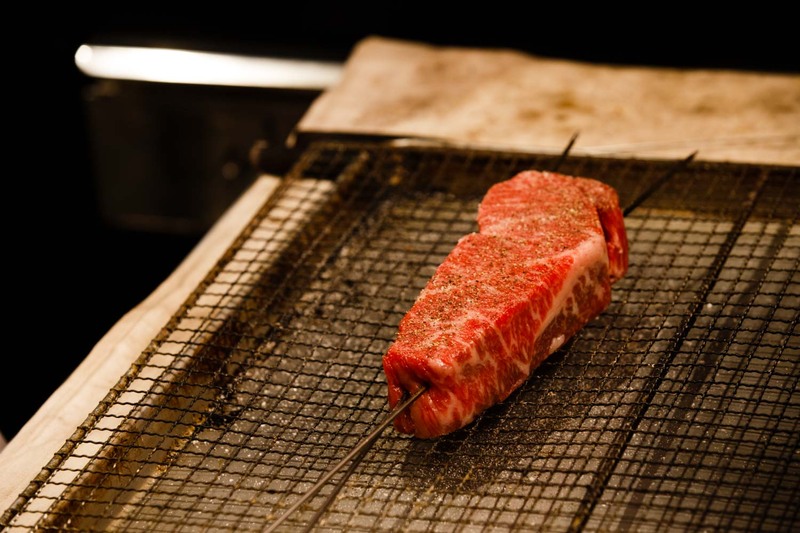 While many visitors to Japan experience yakiniku and teppanyaki styles of beef, and people around the world have grown familiar with wagyu and the appeal of its beautifully marbled flesh, the mouthwatering deliciousness of premium Kobe-gyu charcoal-grilled in a brick oven is still relatively unknown. Sugai and the team at IDEA have made it their mission to change that. 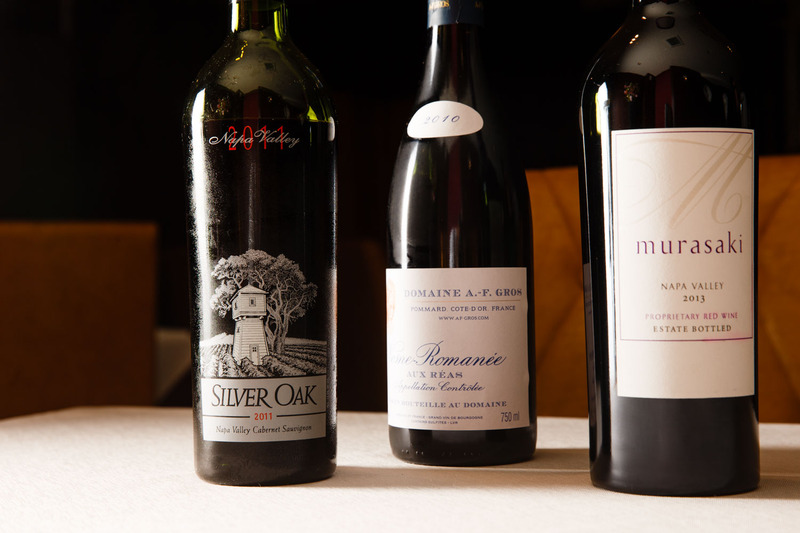 It is hard not to notice the cellar brimming with hundreds of magnificent wines at the edge of the main dining room. A cabinet of wine glasses holds the perfect shaped glass for every grape variety, from elegant Pinot Noirs, such as Vosne-Romanée from Burgundy, to the bolder wines from Bordeaux and the new world. 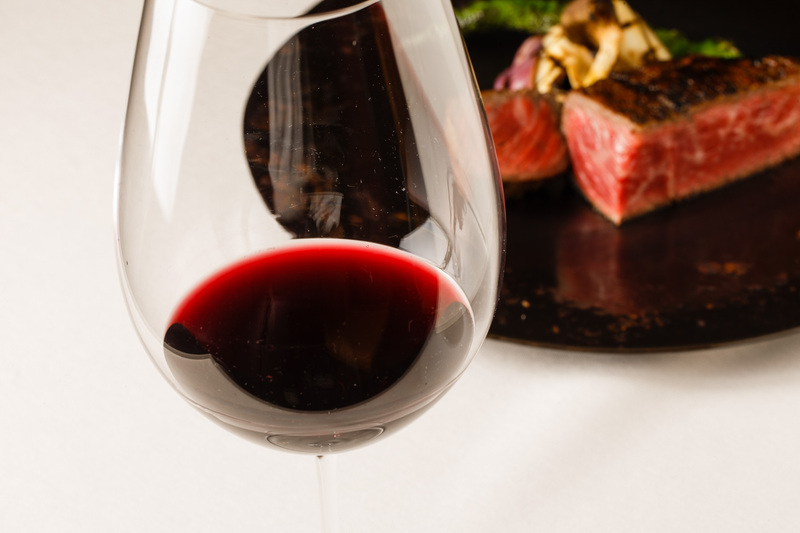 Enjoy the magnificent sounds and aromas as an enormous glass is poured with wines from the premier cru chateaux of Latour and Mouton Rothschild or the highly acclaimed vineyards of Napa Valley, including Harlan Estate, Kenzo Estate and Silver Oak.